Q: The Foreign Ministry website said in a press release that there was a serious traffic accident in the DPRK last night which has already caused heavy casualties. Can you give us more information, including the cause of the accident? What has been done on the part of the Chinese government as well as on the DPRK side? A: Last night, a major traffic accident occurred in North Hwanghae Province of the DPRK. 32 Chinese nationals and four DPRK staff members were killed in the accident. Two additional Chinese citizens were in a critical condition due to serious injuries. We express our deep condolences to the deceased compatriots and the DPRK nationals and offer our heartfelt sympathies to the families of the deceased and the injured. The Foreign Ministry has already dispatched a task force accompanied by medical experts to the DPRK this noon to work with the DPRK side on rescue operations, medical treatment and other matters. The Chinese government always attaches great importance to the safety of Chinese citizens overseas. 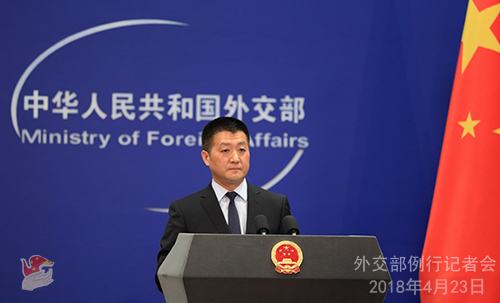 The Foreign Ministry and the Chinese Embassy in the DPRK activated the emergency response mechanism at the earliest time possible upon learning about the accident and have been working with the relevant departments and local authorities to deal with the emergencies and make follow-up arrangements. The DPRK side also takes this case very seriously. Its relevant departments are coordinating closely with the Chinese side in rescuing and treating the affected, in arranging for the follow-up matters, and in investigating the cause. China will remain in close communication and coordination with the DPRK to do whatever needs to be done in the next step. Q: Can you confirm whether the death toll was 32? Were they all Chinese or does that also include DPRK nationals? Is the Chinese government helping to arrange for the relatives of those who died to the DPRK? Do you know where in China they came from? A: So far, there are 32 Chinese nationals and four staff members from the DPRK that were killed in the accident. Since learning about the information last night, the Chinese Foreign Ministry and the Chinese Embassy in the DPRK have launched the emergency response procedures and made all-out efforts to cure the injured and protect as necessary the corpses of the deceased. We are also in close communication and coordination with the DPRK side on follow-up matters and investigation. At this moment, the relevant work is still proceeding against time. When we get more information, we will let you know timely. Q: The Indian Prime Minister Modi will be coming for an informal meeting with President Xi at the end of this week. A lot of people, including the media, are very curious. I remember the last time Prime Minister Modi came, President Xi Jinping took him to Xi'an, because there are some historical sites that are deeply connected with India, historically speaking. What is the reason for choosing Wuhan this time? A: The relevant arrangements for the meeting between the Chinese and Indian leaders are made upon consultations between the two sides. The aim is to ensure that their in-depth talks could take place in a good environment. When preparing for the meeting, the Chinese and Indian sides maintained close coordination and worked along very well in finalizing the time and place for the meeting, among other matters. Both sides have demonstrated good faith and a lot of consensus have been reached. We are convinced that the meeting will turn out to be a success and inject new impetus into the development of our bilateral ties. Q: The Foreign Ministry yesterday released the news that former Myanmar President Thein Sein met with State Councilor and Foreign Minister Wang Yi. I understood that Thein Sein had already stepped down. So why was he in China and was he here as the special representative of the Myanmar government? A: We have released relevant information on State Councilor and Foreign Minister Wang Yi's meeting with former President Thein Sein of Myanmar yesterday. Their meeting was one for friendship. State Councilor and Foreign Minister Wang Yi said that the "paukphaw" friendship between the two peoples runs long and deep. With the joint efforts of the two leaderships, the comprehensive strategic cooperation between the two countries has made substantial strides. We stand ready to work with Myanmar in moving forward the building of the China-Myanmar Economic Corridor and implementing major projects to inject new vitality into Myanmar's economy. The two sides also talked about some issues of mutual concern, such as Myanmar's peace and reconciliation process and Myanmar-Bangladesh relations. China supports Myanmar's peace and reconciliation process at home. We support better ties between Myanmar and Bangladesh and a proper settlement of issues between the two countries. You mentioned that Mr. Thein Sein has already stepped down. But he is also an old friend to the Chinese people, and you know how we Chinese people treat an old friend. So, whether he holds that office or not, as long as he is making efforts for better cooperative relations between China and his country, we are more than pleased to continue our friendly contacts with him. 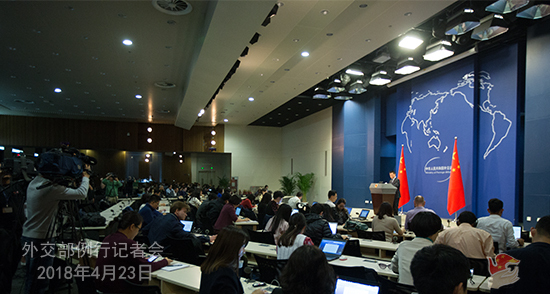 Q: We have noted that yesterday State Councilor and Foreign Minister Wang Yi released the information that the Chinese and Indian leaders will hold an informal meeting. What will be discussed during the meeting? A: Yesterday, State Councilor and Foreign Minister Wang Yi and Indian Minister of External Affairs Sushma Swaraj, when holding a joint press conference, announced that President Xi Jinping and Prime Minister Narendra Modi will hold an informal meeting in Wuhan from April 27 to 28. Since then, that announcement has attracted great attention from the two countries and the international community. As important neighbors to each other, China and India share a lot of common features, like time-honored civilization and one-billion-plus population. As the international situation undergoes profound changes and presents an obvious tendency for destabilization and uncertainty, China and India, as the two largest developing countries and important emerging markets, also share common interests, concerns and propositions. Our two countries are the mainstays for a multi-polar world and economic globalization. We are important champions for regional and global peace, stability and development. At yesterday's joint press conference, the two sides also agreed that the strategic and global significance of China-India relations has become more prominent and that our common interests far outweigh our differences. Everlasting friendship, mutually beneficial cooperation and common development represent the inevitable choice for the two countries. When the two leaders meet, they will have strategic communication on the most profound and unprecedented changes the world has seen in a century and thoroughly exchange views on the overall, long-term and strategic issues of China-India relations. This will chart the course, set new goals and break new ground for bilateral ties. We believe that their meeting will move forward China-India relations, which will not only benefit our two countries and two peoples, but also contribute to regional and global peace and development. Q: Could you offer more details regarding the traffic accident in the DPRK? What is the main cause of the accident? Some reports say that the bus fell from a bridge. Can you confirm that? How many passengers were on that bus? A: This serious accident weighs not only on the minds and hearts of the families of the deceased and injured, but also on the thoughts of the whole society. As I just said, the priority at the moment is to properly handle the emergency needs and in particular help and treat the injured. China and the DPRK are also cooperating closely on other follow-up matters, including investigating the cause of the accident. I hope I could count on your understanding that it is not very convenient to disclose more until solid facts are established via investigation. Q: Last Saturday, the DPRK decided to stop nuclear and missile tests and the Chinese Foreign Ministry Spokesperson made remarks on this. Do you have any further comments? Against such a backdrop, how does China view the international community's imposition of pressure on the DPRK? Some Chinese media believed that the international community should show some encouragement to the DPRK by lifting part of the sanctions. What is your comment? A: Regarding the major decision announced by the 3rd Plenary Session of the 7th Central Committee of the Workers' Party of Korea, the Chinese Foreign Ministry has made a timely response. I would like to reiterate that China welcomes the decision made by the Workers' Party of Korea to suspend nuclear tests and intercontinental ballistic missiles tests and focus on developing its economy and improving people's livelihood. I believe that you may have noted that all parties of the international community have expressed their welcome. Up to now, we have seen not a single party that opposes or does not welcome this decision. We believe that the DPRK's decision is conducive to further ameliorating the situation on the Korean Peninsula, realizing denuclearization of the Peninsula, and promoting the political settlement process of the Korean Peninsula issue. Achieving denuclearization of the Peninsula and enduring peace for the region serves the common interests of the people on the Peninsula and in the region and meets the shared aspirations of the international community. 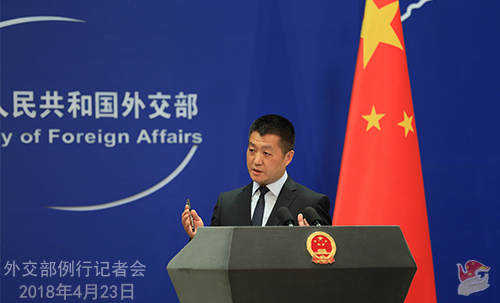 As to whether the international community should ease or lift some sanctions on the DPRK following that major decision, as some opinions suggested, China is consistent in its position. Firstly, all the DPRK-related resolutions of the UN Security Council should be implemented in an accurate and complete manner. The relevant resolutions not only spell out sanctions on the DPRK's nuclear and missile programs but also encourage the adoption of all possible measures to help realize denuclearization and regional peace and stability. Secondly, the DPRK's decision meets the shared aspirations of the international community. The international community has every reason to encourage all parties to move in the same direction and make concerted efforts to ultimately bring the Korean Peninsula issue to the track of peaceful settlement through political dialogue. Q: Are you saying that China would encourage other members of the Security Council to act and ease sanctions on the DPRK in some way? A: Like what I said just now, first, all parties of the international community, including China, expressed welcome to the DPRK's decision. Second, the international community should give positive consideration to all efforts that are conducive to further easing the situation on the Peninsula and bringing the Korean Peninsula nuclear issue to the track of peaceful settlement through negotiation and dialogue. Q: We noted that the US State Department has issued the Country Reports on Human Rights Practices for 2017. Some analysts believe that the US augments criticism on its "strategic rivals" in the report while keeping silent about the human rights problems of its allies and itself. By doing this, the US has forgone its moral legitimacy in criticizing others on the human rights issue. What's your comment? A: The comments you cited in your question faithfully represent a long-standing view held by vast members of the international community. This annual report that the US keeps issuing to make irresponsible accusations against others has been an object of aversion for most members of the international community. The China-related contents of this year's report are just like their previous ones, void of facts but full of bias. We have lodged stern representations with the US side and made it clear that their previous attempts to interfere in China's internal affairs and impede China's development in this way have all failed, and their future ones are doomed to fail, too. The Chinese government attaches great importance to protecting and promoting human rights. Since the establishment of the New China, in particular over the past four decades of reform and opening-up, historic progress has been made in China's human rights cause. For this, the Chinese people have the biggest say. We agree that countries could conduct equal-footed dialogues and exchanges on the human rights issues on the basis of mutual trust so as to learn from each other and improve together. Meanwhile, most members of the international community, China included, oppose politicalizing the human rights issues. Q: You mentioned that the leaders of China and India will discuss the profound changes in the current international situation and the common challenges they face. What has changed in the international situation? Why did the Chinese and Indian leaders choose to meet now? Will they discuss such issues as free trade, protectionism, US leadership, and the Korean Peninsula? A: At the press conference yesterday, State Councilor and Foreign Minister Wang Yi talked about the significance and relevant considerations for President Xi Jinping and Prime Minister Modi's upcoming informal meeting in Wuhan. Leaders of the two countries will fully exchange opinions on issues of mutual concern. This is also the original intention of arranging this informal meeting. As for your reference to the international background of the informal meeting and what issues will be discussed in this context, in fact, you are very clear that the international community is indeed facing an upsurge of unilateralism and protectionism. Such a trend has generally concerned and worried the international community. China and India share many common attributes. Both are big developing countries, emerging markets, and largely-populated states. When it comes to international affairs, especially on the multilateral stage, both sides believe in a multi-polar world and advocate efforts to promote economic globalization and make it more open, inclusive and balanced for the benefit of all. As I said just now, China and India share a wide array of common interests, common concerns and common propositions. The leaders of the two countries will have an in-depth exchange of views on the overall, long-term, and strategic issues of the Sino-Indian relations, and they will also discuss the trending issues of today's world. Stronger cooperation between China and India will make the world more peaceful, stable and prosperous. Follow-up: Are the leaders of the two countries intending to release signals to the US that its protectionism will pose a danger to the international community? A: I cannot predict what the leaders will specifically talk about. I can only say that the leaders of China and India will exchange views on some global and strategic issues. As for the results, I cannot predict now, but I believe that you will get very positive messages.